I was motivated as a young man to read early Christian writers. As a Protestant involved in what can be called the "Free Church" model, I had been taught certain things about the early Church and the Catholic Church; as I studied and became more familiar with early Christianity in my Ph.D studies I began to realize that I had been taught something like a conspiracy theory. 2. Constantine was evil and used the Christian faith for political reasons. He made Christianity the official religion and influenced the Church to adopt pagan beliefs. 3. The Catholic Church started under Constantine and continually became more worldly. I will begin only with basic comments, but I am happy to develop each "myth" by answering specific questions or addressing comments. It is true that the early church was a vibrant movement, pushing the gospel forward in the face of intense Roman persecution. Christians were hunted down, imprisoned, and many executed for their belief in Christ as kurios ("Lord") and their refusal to share allegiance with Caesar. This text in Didache is not the only such text, but illustrates the issue. When you see texts addressing a particular problem it is an indication that the problem was not a one-time issue. Basically what I am arguing here is that the early Church was similar to the modern-day Church and similar to the Church in every era: areas of greatness in serving Christ AND areas of disappointment and/or hypocrisy. The argument that things are worse now is easy: there are more Christians living in more diverse circumstances and in so many different cultures - it would make sense that we have more ridiculous behavior and doctrine now. My point is that the early church, though it had some great examples to follow, was flawed just like the modern church. The myth that the early Christian church was a model for following Christ. I am not sure that is what we think. It is not what was taught in Seminary when I was there. It is not what I think now. The conviction is that the primitive or Apostolic church modeled some things that are not only good but should be normative. However, no one who reads the New Testament as a historical document would say that the primitive church was ideal. There was ethnic prejudice, immorality, conflict, theological error, not to speak of spiritual immaturity. - The first is that the Apostolic church was more an organism than an organization. That looked messy at times, I agree, still it had life, and at its best it was very good. - The second is that the Apostolic church was not political. Of course, at the beginning the church was small, and was made up largely of the powerless. It is not surprising that it had no political power. But that is not the point. The point is the primitive church sought no political power. Jesus taught that change happened as people were personally changed from the inside. Forcing conformity either within the church body or upon society was not God's way. Historically, the church gradually became more organized and, with organization, imposed more rules. With the merging of the church and political power both in the east and the west more rules were imposed and enforced. Perhaps some of this was inevitable. It would have been difficult to resist. But the result was not better than the ideal of the primitive church. It is that longing for the primitive, I believe, that Christians feel, not a myth that the early church was a model of following Christ. 1. If you attended a decent seminary you indeed should have been given a more thoughtful and accurate view of the early church. The "myth" is typically propagated by the less educated (unless you have access to the early writings and read a good deal of these writings it is difficult to get a solid historical view without having a good historian [Lietzmann, Frend, Chadwick, etc.] to help you). I agree with every statement you made below. I would want to add some comments and nuance, but you summed it up quite nicely. 2. I WAS taught the "myth" which I am presenting. I was taught this myth formally in several contexts within churches typically led by men who had been educated in denominational bible colleges. They probably had one single class in church history which probably spent 1-2 weeks on the "early church," one week on the church in the "dark ages," then 4-6 weeks on the Reformation, with another 2 weeks or so covering the modern church movement and 2 weeks on their particular denominational history. Nobody ever said to me "The early church was the model," but the implication was clear. Also, I was NEVER clearly confronted with the issues of conflict you mentioned that are spelled out in the NT. Again, the "myth," I think, is something passed down in a rather informal and oral tradition format. 3. I read David Bercot's "Real Heretics" early on in my Christian life while I was part of the Free church movement. He definitely presents this myth in a clear presentation. You can read my review of this book - it is not kind. The man was trained as a lawyer. Not exactly sure what/if he has formal historical training, but I KNOW that he has not had formal training in early church history. He makes so many mistakes, yet his work is popular and has been read by thousands of people. Then you get untrained pastors who are already predisposed against the Catholic Church reading Bercot and handing out small bits of it in sermons. It sounds sophisticated and scholarly to the average Christian when their pastor quotes from Tertullian or another early Christian writer. But that pastor can say almost anything and the people will believe him because they do not have the time or inclination to look it up and check context. 4. ANY movement of men is going to develop bureaucracy and politics. I was ordained in the Assemblies of God. We proudly claimed not to be a denomination. Technically, we were an episcopalian government, but each church is kind of autonomous. Boy, did I see politics play out. You just cannot avoid this. - The record from Hegesippus is that James (the brother of Jesus) was in a good relationship with the Jerusalem leadership - this would qualify as political power in my view, although not with the Romans, the Jews were the main political entity in Jerusalem. - The early Christians could not easily seek political power since they were consistently being persecuted. Just as Christians living in Communist China or the former Soviet Union had to operate under the radar, early Christians could not conceive of trying utilize political influence. - Churches actively sought to cooperate with the Bush 41 Administration's "thousand points of light" because we had a President wanting to work together with religious groups to do good things. This is more of what happened later with Constantine - after years of persecution there was an emperor who claimed to be a Christian and wanted to see the Christian faith expand. Did some take advantage and/or abuse the political influence? Sure, but I think it is a bit unfair to compare the second century church situation with the fourth century one. Many things changed which led to differences in the interaction with the government. So while I certainly do not think ALL Protestants hold this "myth," I do see it as a problem especially in the "Free" Church movement sects. If you read my review of DH Williams' "Retrieving the Tradition" you will better understand my perspective on this topic. Then, according to the Myth, something tragic happened: Roman Emperor Constantine claimed to have seen a vision of the cross and "claimed" to have become a Christian. He continued to worship the Sun and to practice all manner of pagan rites. He made Christianity the official religion and from that time forward the Church became the bastardized version of faith, the Catholic Church (Catholic with a capital "C". The early church referred to itself as catholic with a small "c." katholikos in Greek means something close to "universal." There are many things one can say to bring doubt upon the faith of Constantine: his use of the Sun god symbol, his advocacy of Arius, punishment of Donatists, execution of family members and only submitting to baptism on his deathbed. Many Christians of his day appeared to believe that Constantine was legitimately saved. The Donatists doubted it, but they also judged many of the catholics to be lacking. (having not been baptized for fear that his oversight of capital punishment might be held against him). Many other smaller things, signs, or fruits of being a Christian were present in his life. Those who focus on his deathbed baptism need to read my paper on Second Repentance or at least (read the web page on Second Repentance) to understand why many believers chose to wait until the end of their lives to get baptized. In addition to these data, Eusebius and Lactantius (both Christian bishops) certainly believed that he was a Christian. Pagan writers complained that Constantine stopped worshipping with them at the pagan temples and during festivals. Charles Odahl (mentioned below) states that there is no evidence after 312 AD and Constantine's "vision," that he ever worshipped the Sun or pagan gods again. Yet there is plenty of evidence that he was involved with, worshipped with Christians, and gave gifts to the Church. I have just recently (Nov/Dec 2013) read an eye-opening book by DH Williams, "Retrieving the Tradition & Renewing Evangelicalism" and written a thorough review. Williams shows how the "Free" Church (Anabaptists, Baptists, basically non-liturgical, non-episcopalian [no bishops, etc.]) 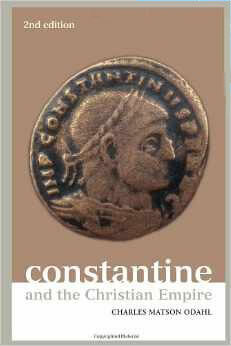 has been affected by believing and using an 8th century forgery as historic information about Constantine. The Donation of Constantine and the Life of Sylvester are two documents that surfaced in the 8th century telling the story of how the Emperor Constantine came down with a form of leprosy, had no success getting help from his pagan soothsayers and called for Sylvester, the Bishop of Rome. Sylvester shared the gospel with Constantine and administered baptism. A day or two later Constantine was healed and in response he writes an edict "The Donation" in which he gifts the bishop of Rome with lands and wealth and bestows on him, as "The Chair of Peter," the leadership of all churches. These documents had a significant impact on the Church from the 8th to the 13th century with various Popes and others leveraging these documents to garner wealth and political power. In the 15th century these documents were proven to be forgeries, but great damage had already been done. What D.H. Williams points out is how Reformers in the "Free"/Anabaptist movements used and made negative references to these documents AS IF they were true. Williams indicates that at least some of these men did this without knowing the documents were forgeries. This negative view and tone against both Constantine and his influence on the Catholic Church still influences anabaptist and "free" Protestants to this day. Under Constantine the Catholic Church is birthed, becomes carnal and politically based. The Catholic Church brings all manner of worldliness: the Pope, monks and their legalistic rituals, prayer to Mary, penance and purgatory. Again, one should consult my review mentioned above of the D.H. Williams text. This myth against Constantine and the Catholic Church/Pope is a direct result of the 8th century forgery, "The Donation of Constantine." If having a single man as "The" leader defines the Catholic Church papacy, this certainly did not happen with Constantine. Bishops were in sharp disagreement prior to Constantine and during his reign there were numerous sharp conflicts between bishops. Catholics argue that the "Catholic Church" started with Peter, but early church historians are all over the map regarding WHEN one can refer to the "Catholic Church." I tend to place the date at 590 when Gregory (later known as "The Great") was installed as Pope. It was under Gregory that all bishops (huge majority) agreed to regard his voice as definitive. Constantine does see the Roman bishop as the natural leader of the church, but in my opinion this comes in part because the seat of the Roman Empire was Rome. The Roman bishop was seen as something of the honorary leader among bishops from early second century. He was called "papa" by some bishops as a sign of respect, but again, conflicts were common and the voice of the Roman bishop was often dismissed by fellow bishops. This is far different from what becomes the Pope of the Catholic Church. To blessed papa Athanasius, Ischyras greets you in the Lord. Worldliness? Following Montanus (cir. 172) Tertullian complained about worldliness in his day (cir. 210-220); the monastic movement began as a response to worldliness. In the beginning these men who gave up everything to live on water and bread (with an occasional chickpea) were definitely NOT worldly. Penance and Purgatory were around long before Constantine. Tertullian writes extensively about penance in his aptly titled work, "On Penance." Purgatory, or at least the concept of a holding place where the dead MIGHT find mercy, is found in 2 Maccabees. Protestant myths about early Christianity are typically fueled by an anti-Catholic sentiment coupled with a lack of knowing the facts. The truth is that the early Church was flawed just like the modern church. Promoting myths, however, does not help anyone. A reader pointed out that my heading was confusing and thus she did not recognize where the "Myth" ends, adding this comment: "But, I don't see how those last two [points] could be part of the myth when its OBVIOUS that the catholic church is the embodiment of 'carnal and political'. Also, it wouldn't hurt to state what the Truth is. If Constantine didn't start the Catholic church, who did? When, where and why? Because you can't just leave people with bad information they can't use, you have to give them something to replace it with that they can use. First, I appreciate the feedback and have corrected this confusion by making the Myth all bold. Unfortunately, I cannot offer the Truth as easily. The Catholics believe the Catholic Church was already there when Constantine came to power - Peter was the first Pope according to this view. I do refer to the early church as the catholic church with a lower case "c" because THAT was how early fathers referred to the movement from the Greek katholikos, "universal." The problem with this third Myth is that for many early church historians the answer is not crystal clear. I will attempt to give some kind of answer below. Who started the Catholic Church? In this crucial council with the western Caesar in attendance the Roman bishop did not even attend. Sylvester had been recently appointed and was too busy according to the record, but the point here is to show that the Roman bishop was certainly NOT seen as Pope like what developed later. In the letter apprising Sylvester of the council proceedings he was called "Papa," but again, this was a title of respect not an official title. So my answer is to say unless we accept the Catholic position (which I do not agree with), a single person did not start the "Roman Catholic Church" and when it started depends on which historian you ask and which definition you accept. With regards to it being "OBVIOUS that the catholic church is the embodiment of 'carnal and political'" I can personally say I have seen "carnal and political" in every Protestant group I have been close to - even small congregations in a house church have carnal and political people and/or things that happen. We cannot easily avoid this and the bigger the group, the more likely we are to see it happen. The Church of Jesus has always been made up of sinners, saved by grace. I'm a convert from Protestantism to Eastern Orthodoxy and agree that, in every age, the Church has had shining examples and regrettable episodes. I'm writing to ask you to clarify your comments about Gregory in 590 -- you say that "all bishops" agreed to consider his voice definitive and thus the Roman Catholic church began. From the Orthodox perspective, this would seem to be a premature date as the Great Schism of 1054 is still 350+ years in the future. Also, even in Rome, many people did not embrace the idea of Pope as the universal leader of all Christians; he was an important Bishop given honor but no outsized ecclesiastical authority. Thanks for clarifying, and for your labors on the site. - Mark W.
Yes, you do point out something of a Chinese finger puzzle introducing the East/West split. However, as you mentioned bringing up the Great Schism in any discussion of Gregory the Great is premature. At the same time there were many issues that went into the ever-growing division of East and West. I do think that Gregory the Great is the first Roman bishop hailed by the overwhelming majority of bishops (at least in the West) to be THE leader. I am not sure whether it was something about Gregory's disposition, his charisma or just timing, but he had a unifying influence. It was probably a combination of all of this...and more. The split between the Eastern and the Western Churches had seeds as far back as the early second century. From very early times many churches in the West celebrated Easter on a different date than the East which celebrated Easter connected with the Jewish observance of Passover. The West, probably reflecting Roman thinking, wanted more separation from Judaism. Interestingly enough, this was another important move Constantine pushed at Nicea even though the overwhelming majority of bishops present were Eastern. In my Christian "tradition" (Baptist) it has always been considered cool to bash anything "Catholic". This "coolness" is quite nasty in actual practice. As I age I have noticed something about my attitude toward other branches of Christian faith. Never has any "rant" of mine uplifted, encouraged, or blessed another believer in Christ. There is something most surely NOT cool about this fact. Based on this observation, I humbly withdraw from the "Christian bashing" business. I have better things to do than refute or tear down other believers in Christ no matter how "wrong" I perceive their practices to be. My perception of their "wrongness" may be wrong itself after all...I truly pray and hope every person who seeks Jesus finds Him and successfully accesses the provision He has made to save them. If there is a greater hope than this, I don't know what it is. This is a response to Steve. I, too, have "bashed" the Roman Catholic Church because I see so many unscriptural practices in this religion. I think, however, that you are right about what you say. Bashing any religion is not productive or kind. One should always just present the TRUTH through the WORD instead of making any kind of comments which do not edify or bring glory to Christ. I do believe that a genuine discussion of the Roman Catholic faith may be important to a person considering the conversion to that religion. But this should always be done with kindness and love. I think many Christian religions should be boiling their message down the to the important salvational issues of Jesus Christ and giving up pagan influences and rituals which have infiltrated the earliest churches. If something cannot be identified or validated by Holy Scripture it is probably not necessary and may even be harmful. Also, in my opinion, one should be careful of the influences of the emerging church and the mixing of all kind of religions into Christian practice. First, THANK YOU to everyone sending in comments. This comment above illustrates how CH101 readers DO read comments. I get nasty e-mails from Protestant fundamentalists accusing me of being Catholic. From time to time I will get a dismissive e-mail from a Catholic or Orthodox believer, but in all honesty I rarely get nasty notes from that side of the aisle. One exception was an Orthodox priest (he had "converted" from being a Baptist pastor) who felt it his duty to show me the way. Once he discovered that I was not ignorant of Orthodox dogma, but simply did not agree with it he began to wax judgemental and I stopped replying to his messages. Here is my point for Protestants regarding many of the things they see in the Catholic (or Orthodox) Church that reflect, as Sherry says "so many unscriptural practices:" Many of these practices were gained FROM the early church fathers in the first to the fourth centuries. Protestants fail to understand the concept of "tradition." Indeed, many Protestants boldly proclaim they do not believe in "tradition" while they actually do - many things they hold as true are NOT clearly taught in the New Testament - this points to "tradition." Historical data is a difficult thing to deal with when it goes against your particular set of "tradition." To be clear, I do not accept ALL the traditions of the early church as valid or "inspired." This was my problem with the above-mentioned Orthodox priest and this is why I could never follow that tradition with all of my loyalty. I would be expected to agree with ALL of their traditions. I have found the Catholic Church to be less dogmatic in this way, but cannot see myself moving into tradition either. Sorry, I cannot do this just because "that is the way it has been done from the beginning." I realize this can appear arrogant from their perspective, but what those from the more ancient traditions sometimes fail to acknowledge is that the early church was not monolithic - there were ALWAYS bishops/regions that did not agree with certain particulars.